A: Welcome to VOV24/7’s Food Delight. B: Haggis, the national dish of Scotland, is the highlight of today’s show. Scotland’s rugged beauty and mystical Celtic charm create a land of mystery which inspires outsiders to explore. A: Green pastures, centuries-old castles, festivals, Scotch whisky, and especially kilts, the traditional costume of Scottish men are what I know about Scotland. B: It would be a mistake to leave out “haggis”, a savoury pudding of Scotland. On today’s show, we welcome Kim Mc Culloch, a lady from Scotland who will tell us more about the national dish of her homeland. Kim: Hi, I’m Kim Mc Culloch. I’m from Aberdeenshire, Scotland. Haggis is a traditional dish we eat in Scotland. It’s quite hard to actually make at home. Some people do but there are a few butchers that would make haggis. One of the main places that it came from is Stornoway, which is the very north of Scotland. Stornoway is famous for haggis. 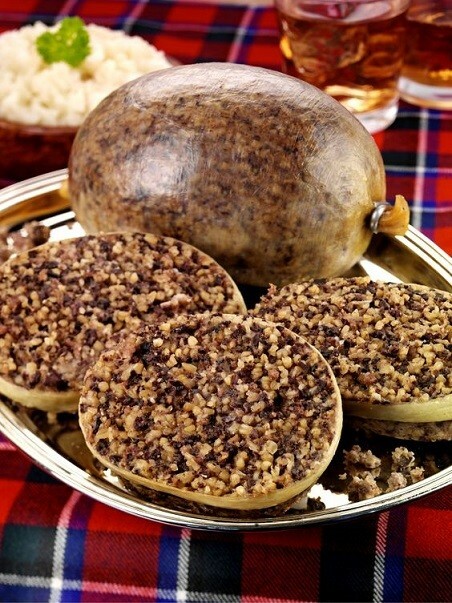 Haggis is originally a meal, in history it was a meal for peasant society. Those people did not have much money. In order to have a big meal, they would make the haggis from the offal and parts of the sheep. A: Kim, how special is haggis to Scottish people? Kim: We have a special day in January in Scotland called “Burns”, which is Robert Burns, a famous poet. We address the haggis, so we have big celebration with haggis. We have a special saying that we say to the haggis, and we toast it with a dram of whisk. And then the haggis is opened. It’s usually a very large one for the whole table, and we would share that between everyone. It’s very special day and very traditional. B: How interesting. If only we had a special day for pho in Vietnam because pho is my favorite. Actually, what is in haggis? Kim: Haggis is actually made from sheep stomach, the lining of the stomach encloses all the ingredients, it’s like the package. That’s the sheep stomach that everything goes into, then the heart and the lungs of the lamb, we have beef, we have fat as well, and some of the lean meat, usually the part of the meat that is not often used. We have onions. All of these are very Scottish ingredients as well. Most are familiar with museli. The ingredient of oatmeal will bind together all of the meat parts, with the onion, and oatmeal is the binder. It keeps all the meat together. We season it with salt and pepper, coriander. A: The main ingredients are the liver, heart, and lungs of a sheep. It seems like a big, heavy meal. Maybe we can’t eat haggis every day. How is haggis cooked, Kim? Do you boil it or fry it? Kim: When we’ve got all the ingredients together, the meat and the lamb, it’s made into an oval shape, the lining of the sheep stomach is covering the ingredients to seal it. And when you cook, it doesn’t burst. We boil it in water. That’s the very basic way of cooking it. It doesn’t open up, it sticks together. It’s in oval shape of a handful size. Because the sheep stomach doesn’t burst when you cook it, you take it to the table and open it with a knife. We serve it with taties or mashed potatoes, and neeps, or turnips. We serve it on a plate that is very big, a warming and comforting meal. B: It sound like an amazing dish. Haggis must be big if everything is packed in a sheep stomach. What about the small haggis you brought us today? It looks quite small, like a piece of candy. Kim: Now, in Scotland, we make a lot of things with haggis. We have haggis pakora, an Indian version, and haggis bon bons, much smaller and more delicate. It’s not a big heavy meal, just a taste of Scotland. That’s enough. A: Are haggis bon bons cooked the same way as traditional haggis, Kim? Kim: For bon bons, we take the haggis out of the sheep stomach and roll it into tiny little balls, truffle size. We put a little flour around it to hold it and then we deep-fry it. That makes it very crispy. B: Thank you Kim for your very interesting talk about haggis, the traditional dish of Scotland. We should have some Scotch whisky to toast. Please join us next time on VOV24/7’s Food Delight.